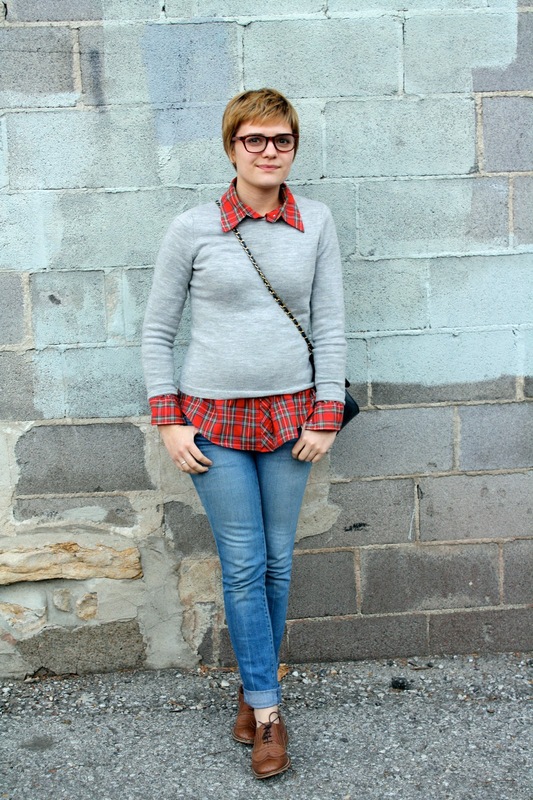 Love the nerdy look : ) I wore a gray sweater yesterday but this is much cuter. I love it, esp. those shoes! I have a soft spot for nerdiness too. Cute outfit. Soooo cute! I love this outfit!! I love the flannel. And one dollar, I submit that it does NOT get better than that. i was the same way - i still have all of my notes/homework/tests saved in organized (chronologically) in binders in my basement. from 9th grade on. Adorable. And I'm the exact same way. I miss school SO much! Le Kiss Kiss- Click Here!! Hurrah for nerds! I was a complete troublemaker in school, but a nerd nonetheless. You look so cute. Love love love love this outfit! I love this look. I have all those pieces so I'm so gonna try this lol. Also I love your blog. Love this. That plaid shirt is perfection! closeted nerd unite! and look at you being a rebellious nerd not tucking in your shirt! check it out when you get the chance! This outfit is perfect. Nerds unite! I think. I. Love. Everything. About. This Outfit.